Note: This message was sent to all RIT faculty and staff August 23, 2016. Happy New (Academic) Year! While this is not an unusual refrain at this time of year, I have observed more people starting conversations with this greeting than ever before. Maybe it is just a comfortable way to get started or, as I like to believe, maybe it demonstrates the RIT enthusiasm to welcome back our students. In any event, it is a good thing. The 2016 Academic Convocation that followed the traditional Tiger Walk was another example of the ‘RIT Way’ of welcoming our newest members of the RIT family. Proud parents, nervous students, intriguing videos, and inspiring speeches all marked the 1-hour convocation. I particularly liked Dr. Kate Wright’s reference to the ‘mindset’ research of Stanford’s Dr. Carol Dweck – it was a great message for our students. But there’s more! At the 2016 President’s Address to the Community, we heard from Dr. Chris Collison as chair of the Academic Senate, Raman Bhalla as chair of Staff Council, Andrea Shaver as president of Student Government, Keith Jenkins from the Office of Diversity and Inclusion, and of course President Destler. All gave terrific messages to start the new year. Now that the traditional Academic Convocation and the President’s address are behind us, I thought I would formally welcome all faculty and staff to another academic year at RIT and share with you some of the plans for Academic Affairs during this coming year. While there are many projects and initiatives for this year, I want to focus on just three especially important ones – Middle States accreditation, the Greatness through Difference strategic plan, and the COACHE survey of faculty satisfaction. I will be sending separate messages concerning other initiatives throughout the semester as these initiatives are fully fleshed out. You can see the full Academic Affairs division plan of work on the Academic Affairs website. Middle States preparations: The RIT Middle States steering committee, led by co-chairs Dr. Anne Wahl and Dr. Michael Laver and guidance from Dr. Chris Licata, has made outstanding progress towards our Middle States Accreditation visit set for April 2-5, 2017. The group, along with eight (one for each Middle States standard and one for compliance requirements) working subgroups, has been formulating the RIT self-study that is due to Middle States in February 2017. The subgroups have completed their work and submitted their reports so the first draft of the self-study will soon be ready for campus vetting. Please await further information. In addition, we are also planning a preliminary visit on October 6, 2016 by the Middle States Evaluation team chair Dr. Tony Collins, president of Clarkson University. 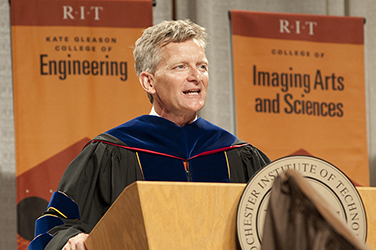 Greatness through Difference (GTD) Strategic Plan: The Greatness through Difference Strategic Plan provides a superb direction for the future of RIT and we are well underway in the implementation process. While Academic Affairs is a key partner on almost every Difference Maker, the division is initially taking the key lead on four important components. Interdisciplinary work action plan: There are a number of Difference Makers and Objectives in the GTD plan that refer to interdisciplinary work of students and faculty and the plan emphasizes the need to expand our footprint in this area. Why? Evidence from the Chronicle of Higher Education and from the Collaborative on Academic Careers in Higher Education (COACHE) indicates three reasons for the expansion of interdisciplinary work: (i) universities across the country have seen growth in research collaboration within and between institutions; (ii) funding for interdisciplinary research has increased; and (iii) there is great interest to cross-fertilize and this work attracts graduate students and early-career faculty. While RIT does considerable interdisciplinary work (think Ph.D. programs for example), we can still make significant improvements and provide more support to faculty and students, who want more such opportunities. The academic senate and my office are co-sponsoring an ‘Interdisciplinary Tiger Team’ that will be charged to develop an action plan for expanding our footprint, hosting a campus retreat during intersession, requesting a budget and an establishing estimated timeline for implementation. Please look for more information soon. On-time graduation report and action plan: Readers will recall that last year we asked the Student Success Steering Committee to establish an On-Time Graduation Task Force to develop an action plan to address Difference Maker I.7. I am pleased to report that I received the report over the summer and it is now available on the Academic Affairs website, along with the original charge. Over the course of the next month, I will be working with the President and the co-chairs of the task force to prioritize the recommendations for implementation. T-Shape Graduate Tiger Team: To address Difference Maker I.1 (The T-shape graduate), the divisions of Academic Affairs, Diversity and Inclusion, Enrollment Management and Career Services, and Student Affairs co-sponsored a T-Shape Tiger Team and charged them to develop an action plan for implementation. You can see the charge on the Academic Affairs website. This team met throughout the academic year and the summer, is on track to submit a report by December, and hopes to do some initial messaging to students this fall. COACHE Survey Results: This past January, the faculty were asked to complete the 2016 COACHE survey as a follow up to the 2013 COACHE work. Just last week, I received the report and have begun reviewing it. In fact, 51% of the faculty participated in the survey with an average completion time of 22 minutes so a lot of faculty time went into filling this out! All I can say is thank you! I have asked Dr. Lynn Wild to once again lead a small team to help with the communication dissemination and the sharing of the data. I have posted the COACHE letter to the Chief Academic Officer online. Please look for more information about the COACHE results in the next several weeks. One last comment. With the academic leadership changes last year, I look forward to working with a great new group of academic deans, executive directors, and associate provosts. Our new deans include Dr. Twyla Cummings, Graduate Education; Dr. Doreen Edwards, KGCOE; Dr. Anne Haake, GCCIS; and Dr. Manian Ramkumar, (Interim) CAST. I have already seen how our new council of deans has changed and there is perceptible excitement amongst all. So it is appropriate, it seems to me, that we provide the RIT community with an opportunity to meet and get to know our college, institute and school leaders. Please look for further information regarding a campus-wide reception later in the semester. Thanks to all of you who welcomed our students enthusiastically and may you all have a wonderful fall semester.